Group shot at the end of the day, with everybody 'exhibiting' their work at Tate Britain. 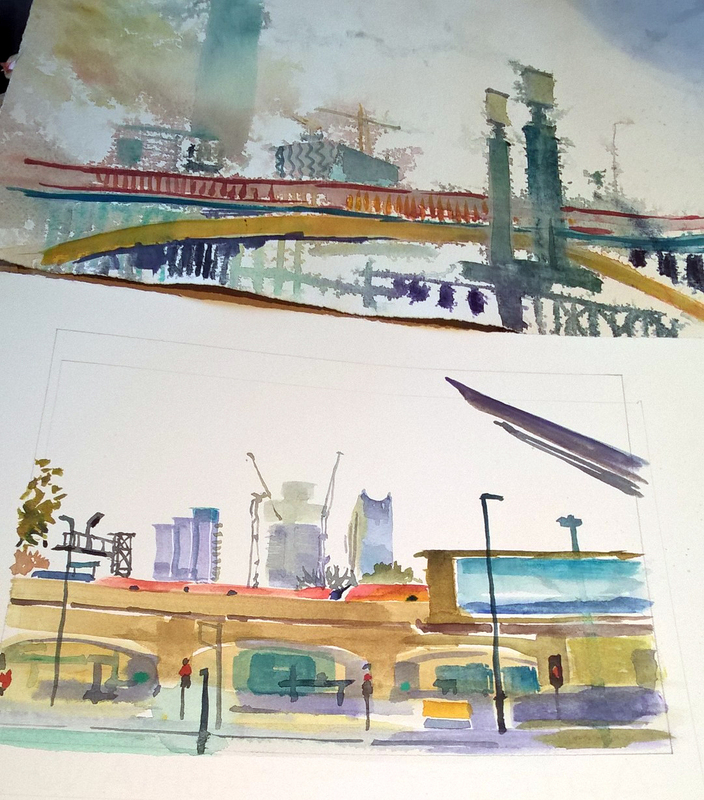 Thank you to everybody who came along to the sketchcrawl in Vauxhall on Saturday. Despite the persistent rain, there was a good turnout and lots of positive comments about the location. Here are just a few snaps of the sketches made during the day. 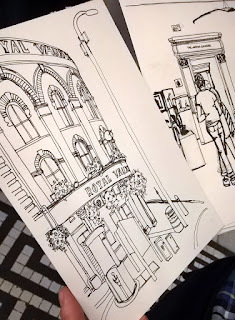 The next sketchcrawl is Saturday 10th December in Covent Garden. 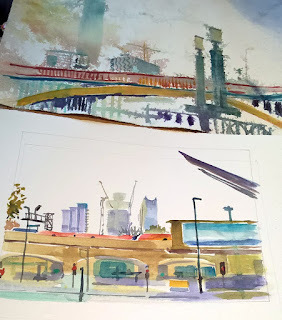 Watercolours from Katy. With added water. This is our provisional programme for the year. We will post more details for each sketchcrawl -- including meeting times and locations -- a few weeks in advance of each event. And if anything changes, we will publish amendments here, too. This programme is brought to you by Jo Dungey and Lis Watkins. We start the year with a contemporary subject - Tate Modern. On the South Bank, opposite St Paul’s Cathedral, Tate Modern opened a new extension in June 2016, designed by Herzog and de Meuron. 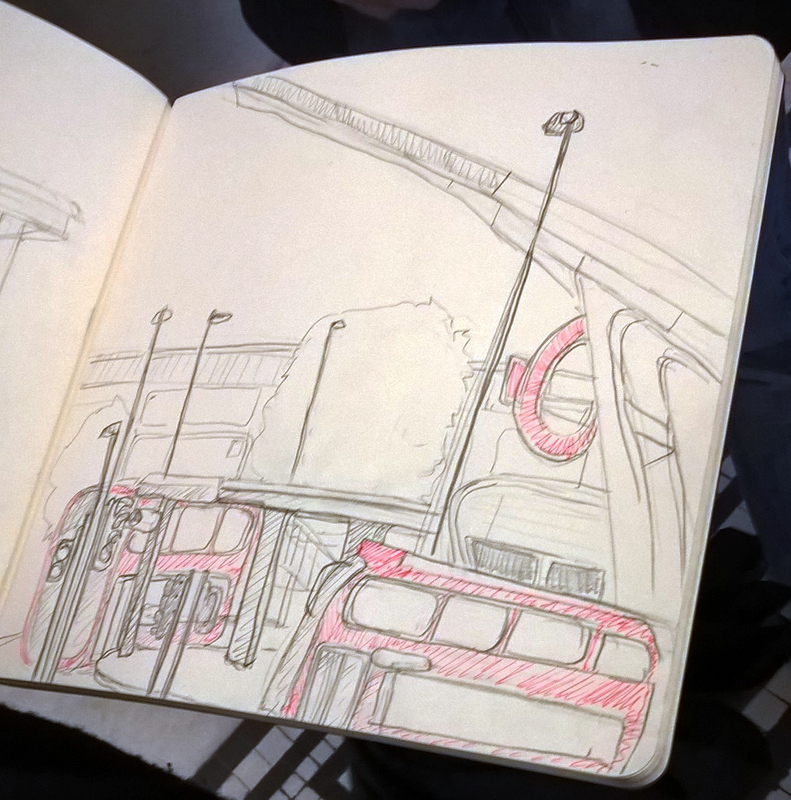 Draw the collection, the public spaces and views over London. Our February event is based at the Barbican Arts Centre in the City of London. This offers a chance to draw interior and exterior views, and visitors involved in the activities of the Centre. 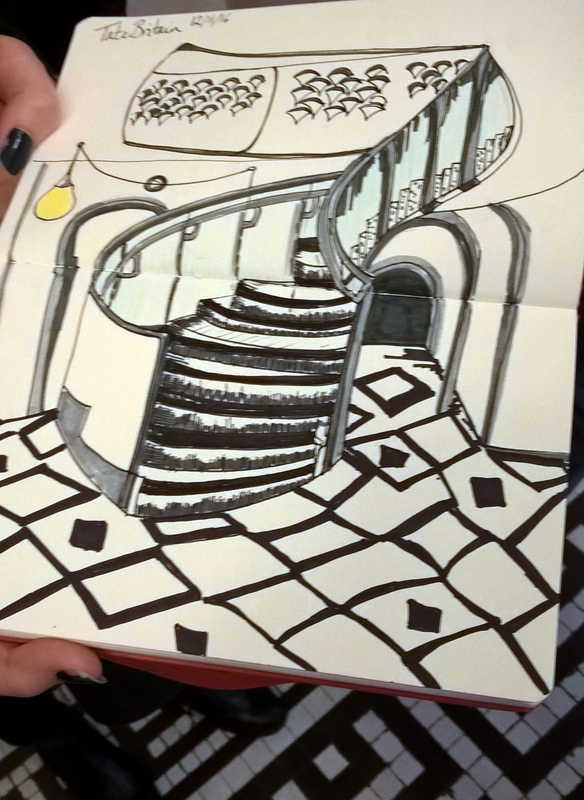 We could also venture out to draw the City, old and new, and the Museum of London is nearby. 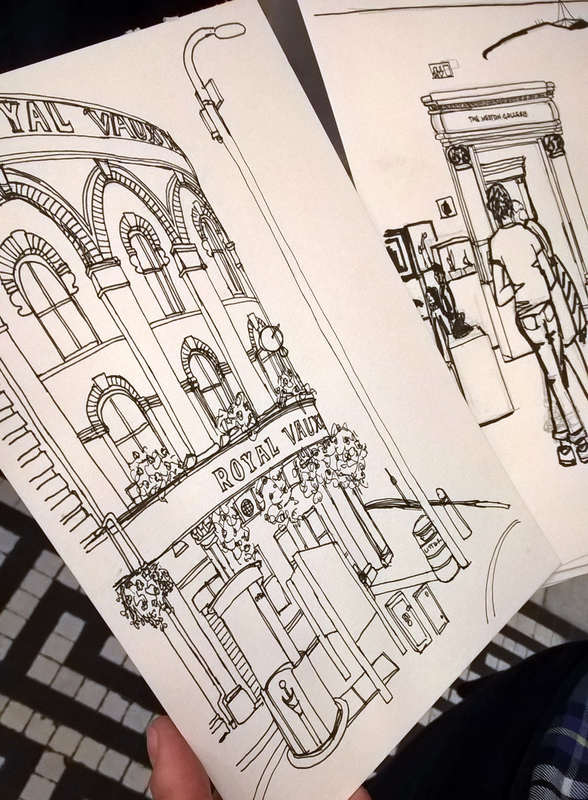 This month we head for Forest Hill, South London, to the Horniman Museum and Gardens. The museum was designed by Charles Harrison Townsend in the Arts and Crafts style, and it has several interesting more recent buildings. There are extensive gardens with views over London, and a small city farm including alpaca and sheep. Inside, the collections include natural history, musical instruments of the world, and an aquarium. We visit Alexandra Palace in North London, a dramatic Victorian building. This is set in parkland with panoramic views. 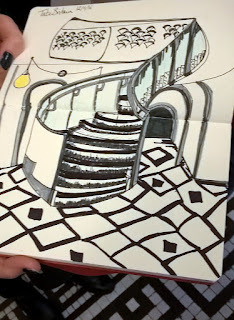 We can draw the building inside and out, including an indoor skating rink, and the Palm Court with sphinxes. The park includes a boating lake and sports facilities. Sloane Square in Chelsea provides our focus in May. 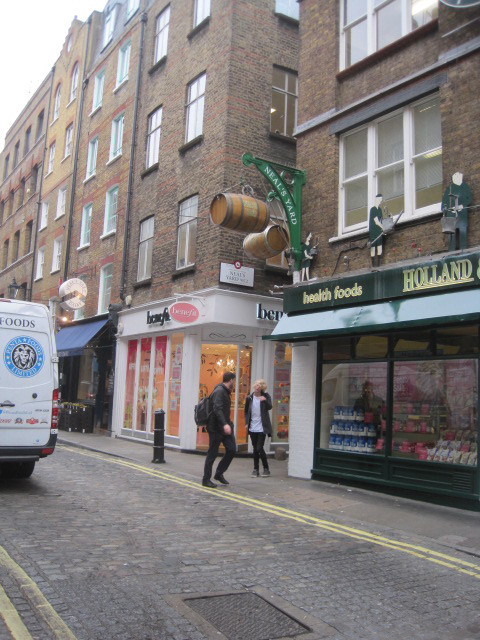 This area offers a mix of historic buildings, including churches, shops, statues and the Royal Court theatre. 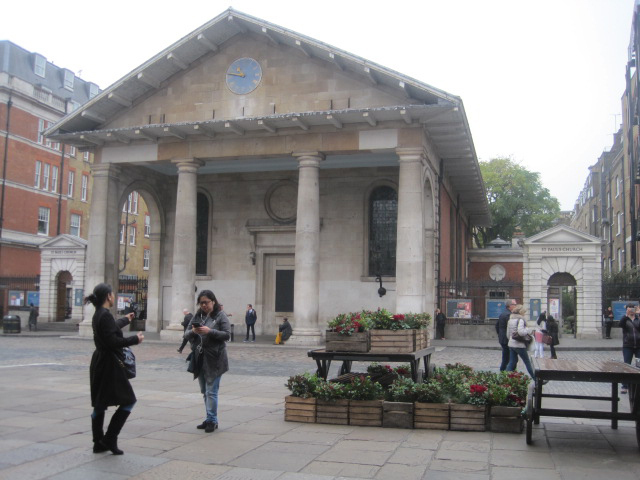 The Saatchi Gallery and Duke of York Square are nearby and there is often a farmers’ market. This day will be focused on two locations: Charterhouse Square and neighbouring Clerkenwell. 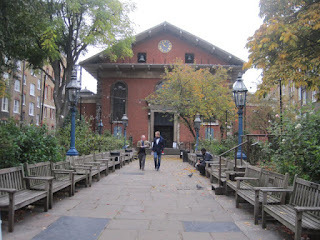 In Charterhouse Square is the Charterhouse, an ancient former monastery and chapel, which has very recently been partly opened to the public, with a new museum. Clerkenwell is an interesting neighbourhood, with a mix of old and new buildings and a concentration of design professions. We will visit the St John’s Gate and museum, including its beautiful Cloister Garden. This replaces the visit to the Inns of Court originally proposed. In July we spend a summer’s day by the river at Richmond, in West London. This offers elegant terraced streets, a view of the river painted by Turner, historic buildings, boats and bridges. This month we visit Hyde Park. Each year the Serpentine Galleries commission a temporary summer pavilion by a contemporary architect, which we could draw. Other options are park views, the boating lake, the Italian Gardens, summer visitors, and sculptures old and new. The Albert Memorial and Royal Albert Hall are nearby. 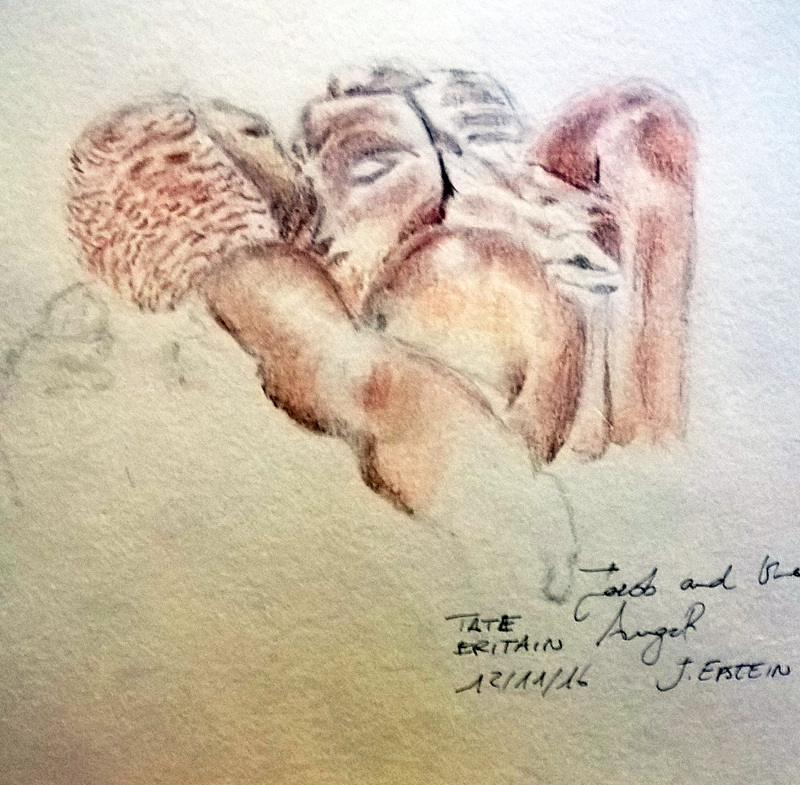 In September, we explore Highgate, including Waterlow Park, the newly renovated Lauderdale House, and Highgate Cemetery, perhaps the most famous of London’s Victorian cemeteries. We visit Spitalfields in October, where the Spitalfields Market is a modern redevelopment in a historic area. Nearby, Christ Church is a Hawksmoor masterpiece surrounded by Georgian houses. In November, we draw Kennington. We explore the area around Kennington Road, South London, including the Imperial War Museum, Cleaver Square and the Newport Street Gallery. 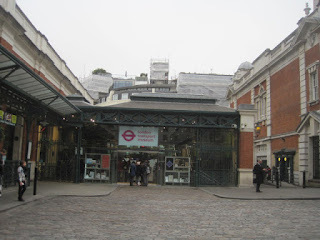 We end the year at the Kensington museums – the Science Museum and Victoria and Albert Museum. There is also usually an ice rink outside the Natural History Museum. 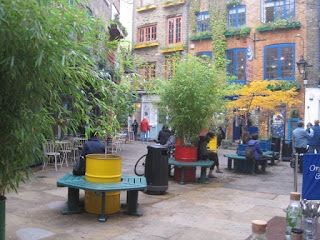 3.30 pm Finish at Neal’s Yard (NB not the modern Thomas Neal shopping arcade). See photo and directions below. 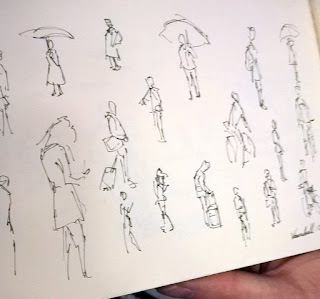 These locations have some shelter if the weather is wet. Shops and stalls, with seasonal decorations. 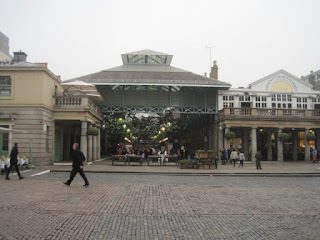 The area known as Covent Garden was originally arable land and orchards belonging to Westminster Abbey – the convent garden. With the dissolution of the monasteries in the reign of Henry VIII (1540), the land passed to the Dukes of Bedford. In 1630, the fourth Duke brought in architect Inigo Jones to develop the area. Inigo Jones designed the church which is there now, St Paul’s, with a Tuscan-style portico, and laid out a piazza in the Italian style – unprecedented urban design for England at that time – with elegant houses around it. For centuries this was a residential and commercial area of varying degrees of respectability, and associated with the arts. The earliest theatres were the Theatre Royal, Drury Lane, and what is now the Royal Opera House on Bow Street. The church is known as the actors’ church and has memorials to many famous names. In the eighteenth century, writers such as Sheridan, Dryden and Aphra Behn, met in the area’s coffee shops, and the artist J M W Turner grew up on Maiden Lane where his father ran a barber’s shop. Since the seventeenth century, the piazza was also used for fruit and vegetable markets, and to bring some order to this, in 1833 the covered central market building was designed. This continued as London’s main wholesale fruit and vegetable market until 1974, when it moved south of the river to Nine Elms. After a campaign against demolition, the market was re-opened to house the kind of shops and stalls we see today. There are some old photographs displayed on walls inside the market building. 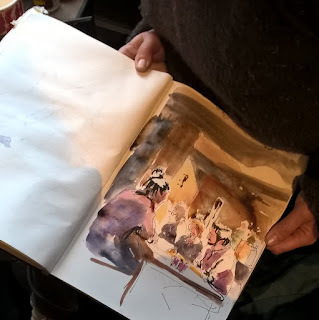 Places to draw which may be slightly quieter include the churchyard behind the church which has plenty of seats, the church interior, and the old streets and courtyards further away from the main piazza. 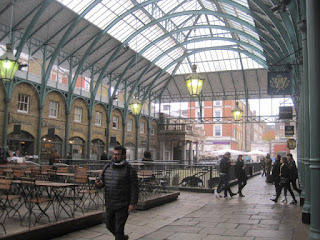 There are plenty of arcades and market buildings if the weather is wet, as long as you are dressed warmly. There are plenty of cafes and bars, and public toilets near the church. We will start the day in front of the church, and end the day at Neal’s Yard. To get to Neal’s Yard, with Covent Garden tube station behind you, walk up Neal Street, turn left into Short’s Gardens and then right down a path next to the Benefits shop, signed above with a barrel.